One great thing about my digital video camera is the 22x optical zoom. Massive. One bad thing is the camera is so lightweight, without a tripod it's damn near impossible to get a decent shot when you zoom very far. 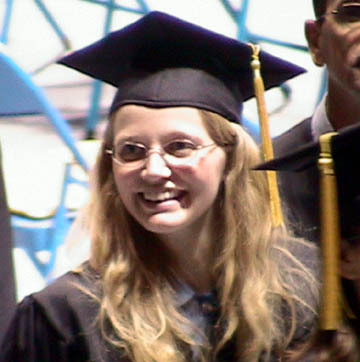 But here's my best shot, so to speak, at Spring's graduation. We were sitting at the other end of the coliseum, so this was the full 22x.